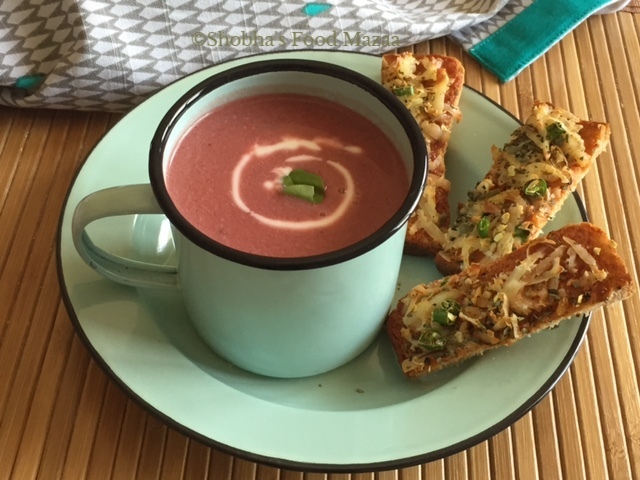 Try out this vibrant and healthy bowl of soup made with beetroot and apple. It is flavoured with a mustard seeds and curry leaf tempering which adds to the taste. In this recipe we are using coconut milk instead of cream. 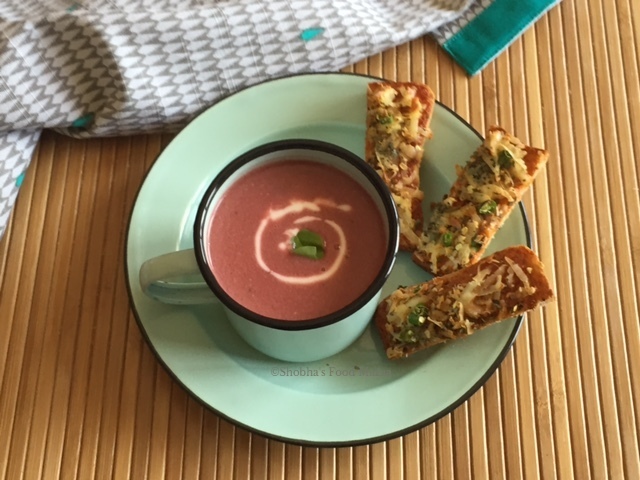 You will really love the taste of this soup. I saw this in the TV show "Turban Tadka" on Food Food Channel. Recipe credits - Chef Harpal Singh Sokhi. Cut the apple, beetroot into cubes.and slice the onion. In a pressure cooker or a pan heat 1 tbsp of olive oil and saute the ginger and garlic. Now add the sliced onion and stir fry for a minute. Tip in the apple and beetroot cubes and saute. Add 3 cups of water and salt. Close the lid and pressure cook it for 4-5 whistles. If cooking in a pan it will take a little longer and you might have to add more water. Remove the pressure and blend the soup using hand blender. Strain it into a pot. Now stir in the coconut milk and black pepper. Give one or two boils. Heat the remaining oil and add the tempering ingredients (mustard and curry leaves) Stir it onto the soup. You may also add bread croutons before serving. Oh my the combination caught my eye and made me read it; saving it for later as this is indeed a superb mix of flavours! !